This week I thought I would focus on a particularly interesting chart for the outlook for the gold price. I think it is particularly interesting, because both bulls and bears will be able to take something away from it to suit their case! But I will say, as a pre-warning, the chart is mostly bearish. It came from the latestWeekly Macro Themes report, in which I outlined a broader short-term and medium-term bearish case for gold. 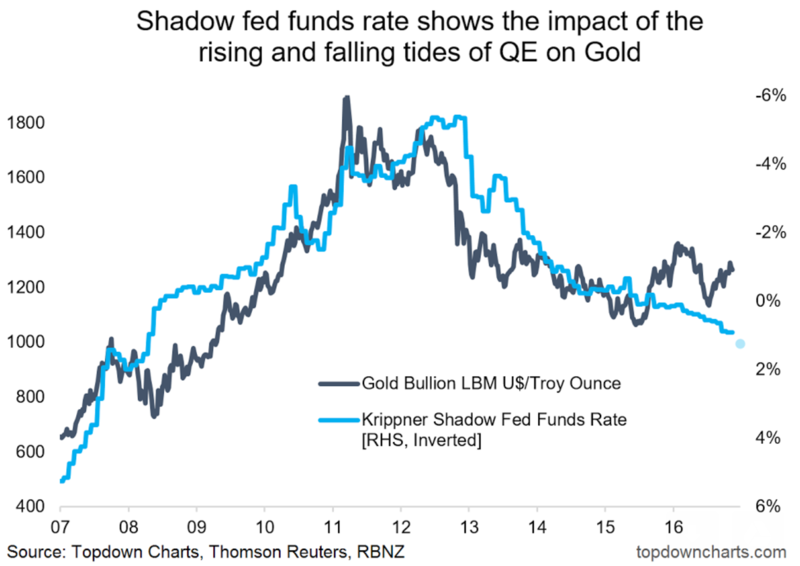 The chart below shows the gold price against an obscure indicator called the “Shadow Fed Funds Rate”, which was invented and continues to be maintained by Leo Krippner of the Reserve Bank of New Zealand. The reason I used theshadow Fed funds rateis that it is designed to show the effective level of the Fed funds rate after taking account of the stimulatory impact of Quantitative Easing or QE. Thus not only does the indicator bring in the actual level of interest rates, but also the impact of QE. For an asset like gold which is closely tied to monetary conditions, using such an indicator brings in a valuable, fundamental signal. Clearly, when the QE tides were coming in (2009 to 2012) this provided a strong bullish fundamental driver for gold to perform. Likewise, since the QE tides began to go out from 2013 onward it has been bearish for gold. This is understandable since interest rates and QE have a fairly obvious impact on the currency (less QE and higher rates = a stronger dollar) and thus would logically and intuitively have the kind of impact that they did. The problem for gold now is that the tides continue to go out as the Fed gradually hikes rates and is talking more and more about how to unwind itsbalance sheet… or how to go from QE to QT. This is likely to have a bearish medium term bias for gold. But as I said at the start, the silver lining for gold (hmmm), is that in the next downturn, you can almost guarantee that the Fed will pull on the QE lever again, and when the QE tides come back in, gold will benefit once again.